A little bit of red, some white, and navy blue... this was my outfit for Memorial Day weekend. I am falling head over heels for this lipstick print leotard from Motel Rocks! They were kind enough to send over some gifts for me to style and feature on my blog, first was the vertical stripes pants a couple of posts back, second is this leotard, and I can't wait to show you the third piece. They are all equally amazing! This leotard is so darling! 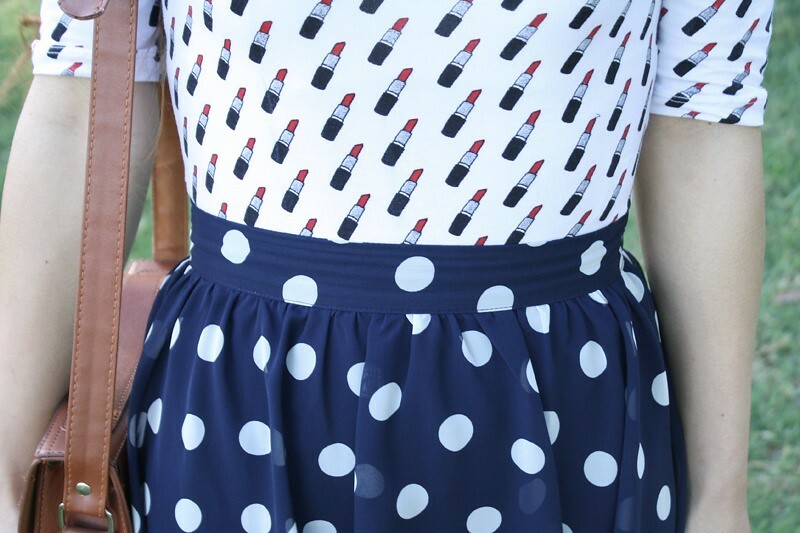 Love the lipstick print, love the low scoop back, love everything about it! 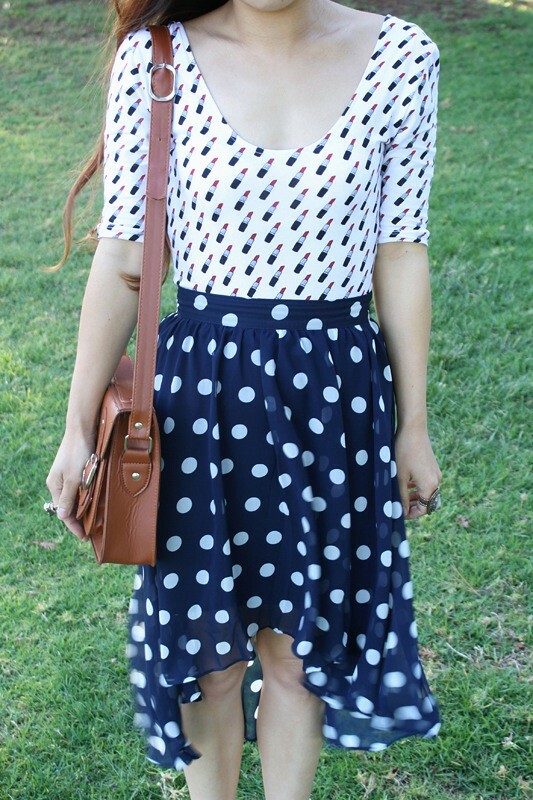 I wanted to play with the pattern by adding another pattern... polkadots! 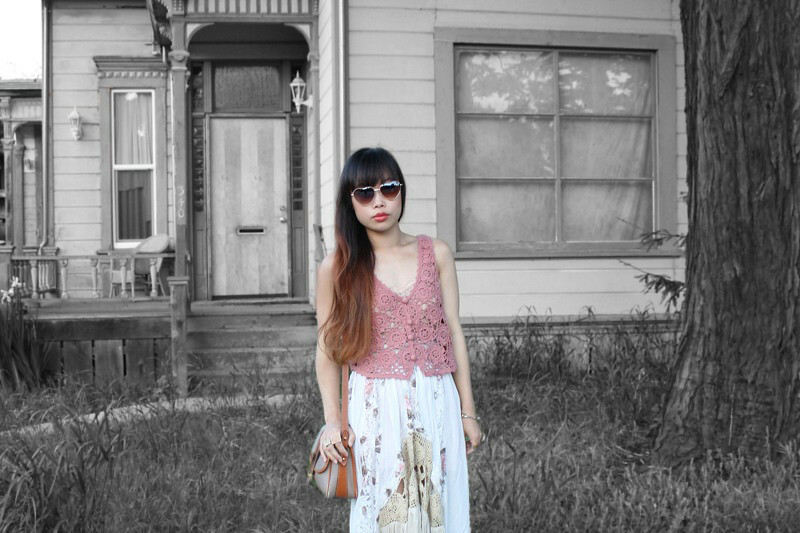 And to make the outfit even more playful I put on circle sunglasses, red lipsticks, and these awesome vintage mesh flats! Lipstick print leotard c/o Motel Rocks. 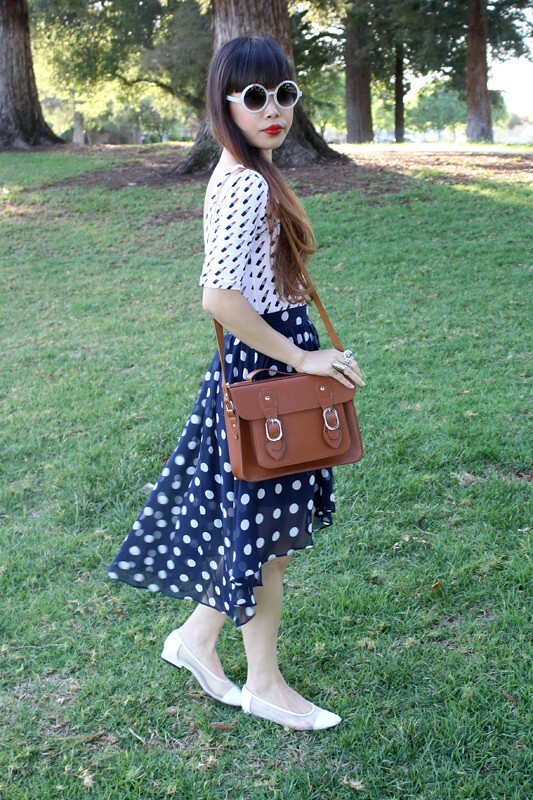 Polkadots fishtail chiffon skirt from F21. Thrifted vintage leather and mesh flats by Karen Scott. On a different note, I have finally hopped onto the iphone wagon, so now I have instagram! I must say I am a little obsessed! Growl! 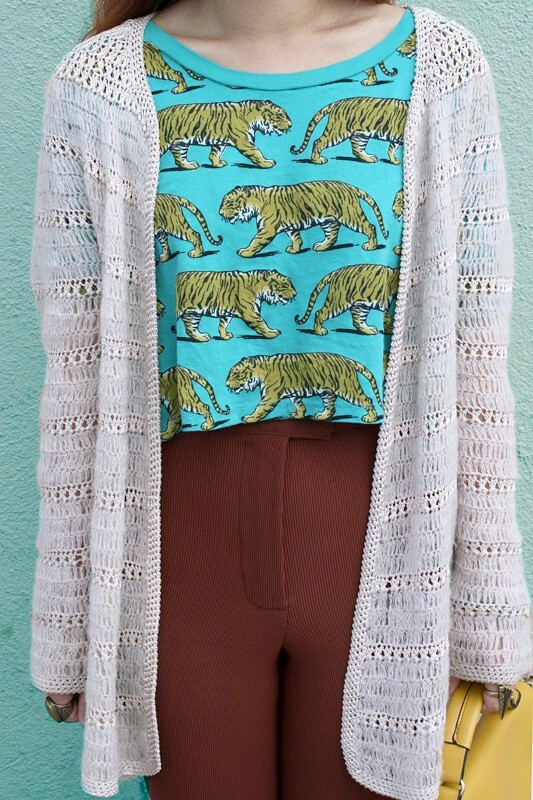 A cropped tee full of tigers, complemented with a pair of high waisted riding pants and some fuschia lips! 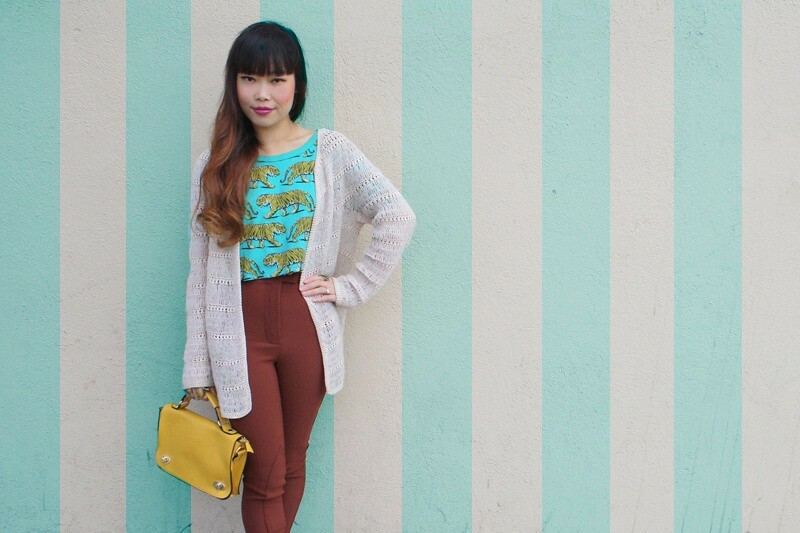 Don't let the top trick you, as vintage as it looks, it is really from F21! I know, I couldn't believe it either. I just love the contrast between the turquoise background and the mustard yellow tigers. This is my easy day outfit, comfy pieces but of colorful hues. 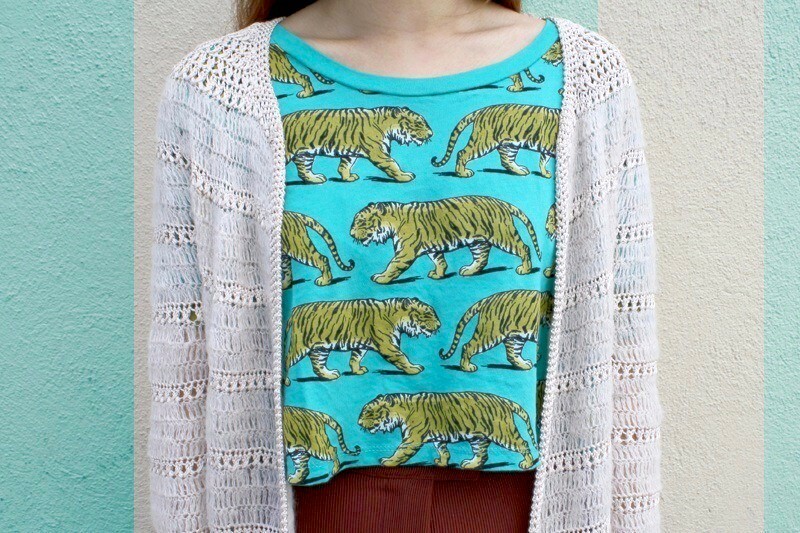 Tigers cropped tee from F21. High waisted riding pants from American Apparel. Vintage cut out leather flats by Ashley Noelle from Etsy. This metal tipped collar top from work and these vertical stripes pants gifted by Motel Rocks are my two favorite pieces of clothing as of late! Let's start with the top... you can never go wrong with a sheer chiffon top! Collar? Always a bonus. 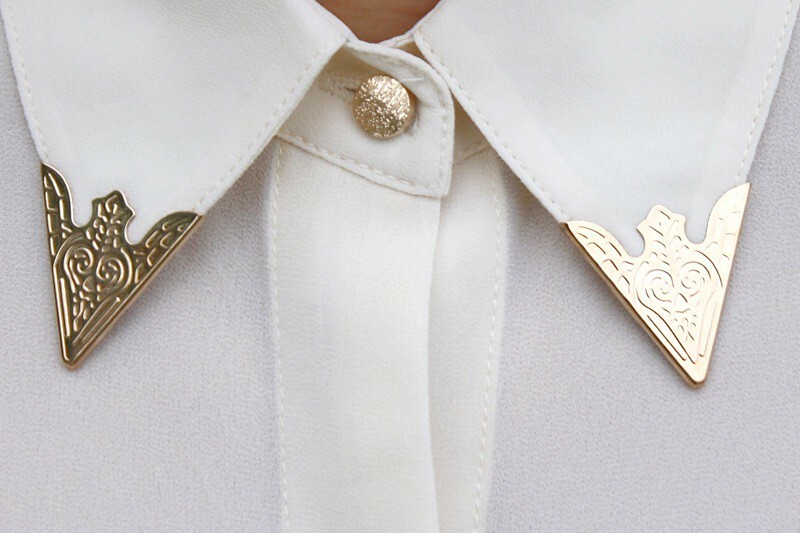 Collar with ornate metal tips? Even better! As for the pants, they remind me of Beetlejuice (one of the best film of all time) and not to mention vertical stripes will always be better than horizontal stripes. I love them! I paired cream with white because white on black and white stripes were simply too stark looking. 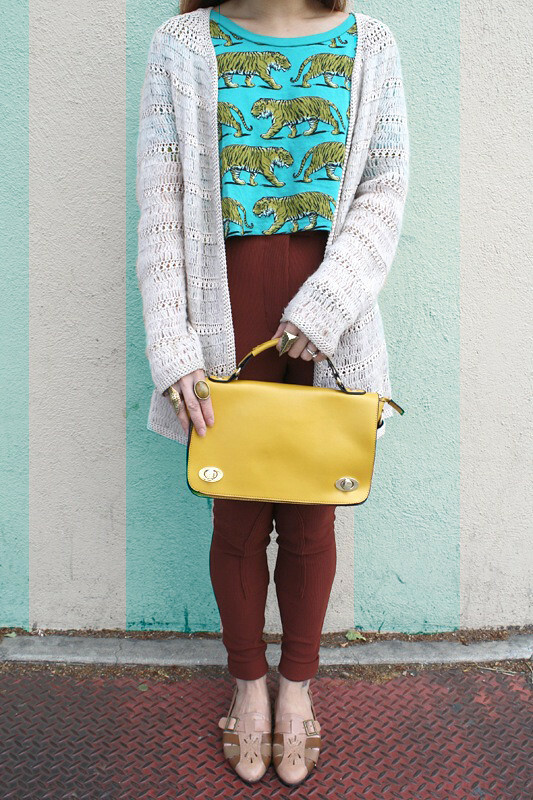 Lastly, threw on some funky bracelets and rings and an awesome vintage purse to complete the look! Metal tipped collar chiffon top by English Rose from my work Sway. Vertical stripes pants c/o Motel Rocks. Vintage Avant Garde tooled leather handbag from Buffalo Exchange. Strappy patent leather pumps by Vince Camuto. Awhile ago I came across the SS 2011 lookbook of ALL Knitwear, I was so intrigued by all the fun and colorful designs that I kept going back to stare at those images days after days. 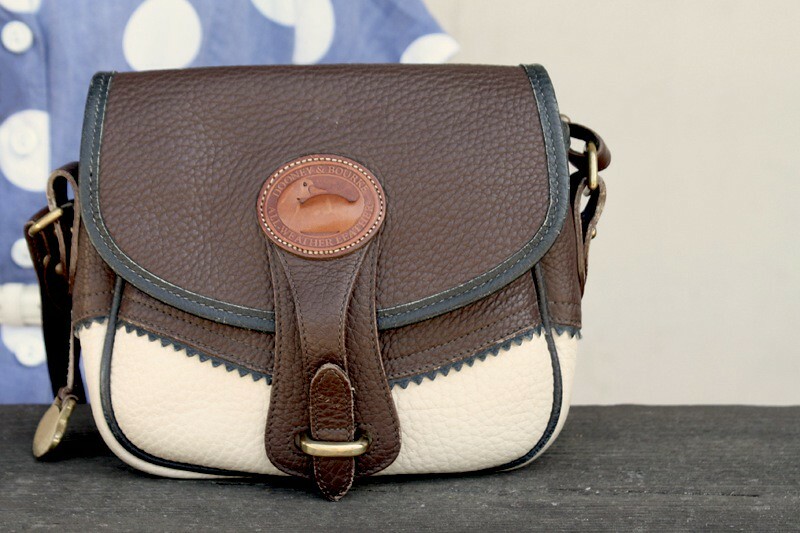 Think pattern on pattern of colors you never imagine would look so good together... but they all work so perfectly! I am in love and inspired! Then, about a week ago I received this vintage colorblock sweater as a gift from Bombshell Shocked, and I thought "oh my goodness, this is so ALL Knitwear!" Upon receiving this unique piece I was already feeling inspired but then I got REALLY inspired! With a giant donut bun on the side, over the knit socks, and some funky and chunky colorblock shoes, this may just be the grooviest outfit ever! 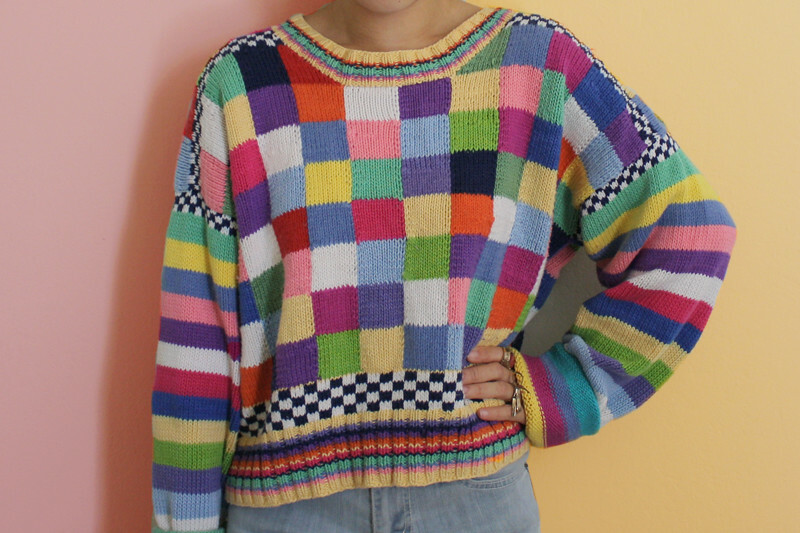 Vintage 80s colorblock sweater c/o Bombshell Shocked. Denim shorts by Hammer from my work Sway. Pointelle knit over the knee socks from F21. Colorblock chunky oxfords by Bumper from UrbanOG. Today is my 28th birthday. Wow I can't believe it, 28 sounds so old when you think of it as two more years until 30. Luckily, thanks to my asian genes, people often question whether I am even 21. Onto my photos... I don't mean to post such an eerie and melancholy shoot on my birthday but in a way it sort of goes with my mood. I came upon this abandoned house on an evening walk, actually I am not sure if it is abandoned. It is very rundown and looks haunted, with curtains and shades covering every windows. 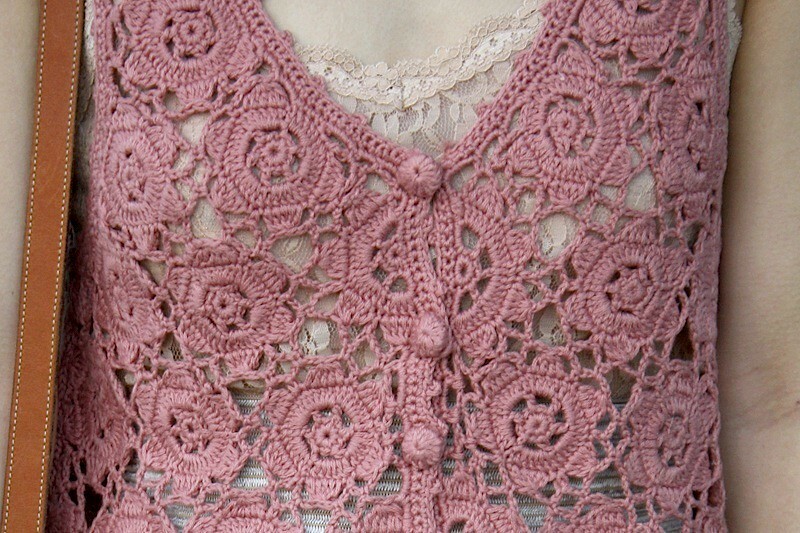 I thought it would create an interesting backdrop for my flowy bohemian look of crochet, chiffon, and lace. 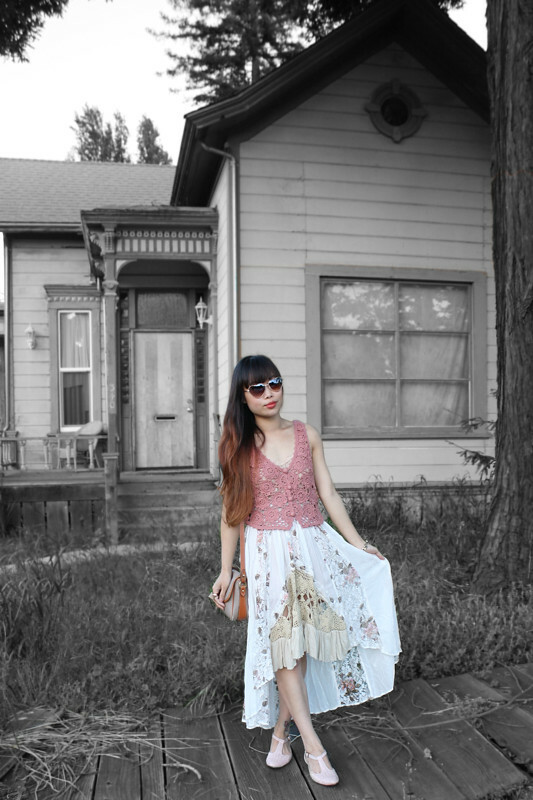 Crochet lace chiffon fishtail skirt by Free People. Dusty rose crochet top from F21. Vintage pink woven t-strap leather flats by Footworks from Etsy. 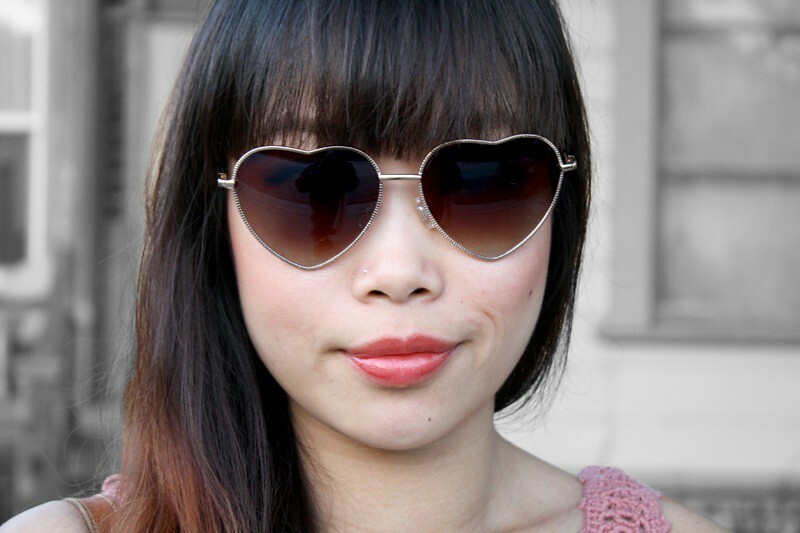 Heart shaped sunglasses from Urban Outfitters. 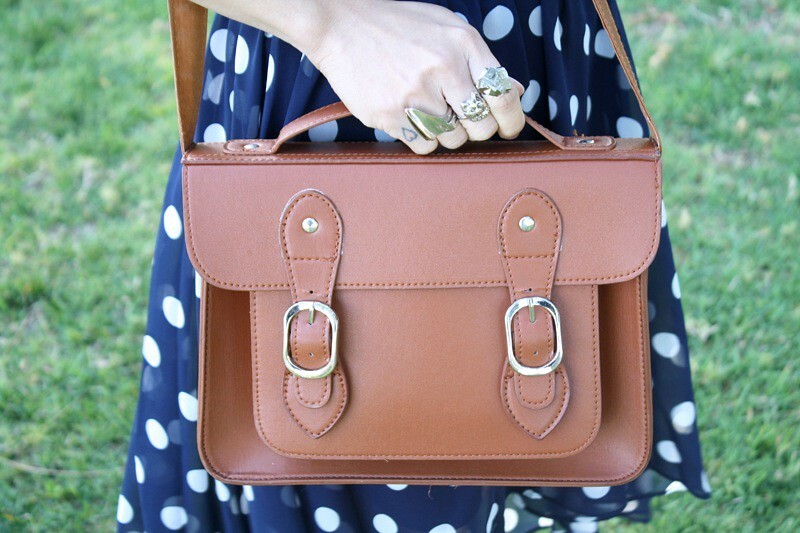 Thrifted vintage leather handbag by Dooney & Bourke. The contrast of my lady like vintage look in this rustic setting is quite interesting. On one hand, my outfit and I seemed out of place. On the other hand, it looks like I was there for a reason. Either way, this shoot was rather spontaneous and I really like how it turned out. 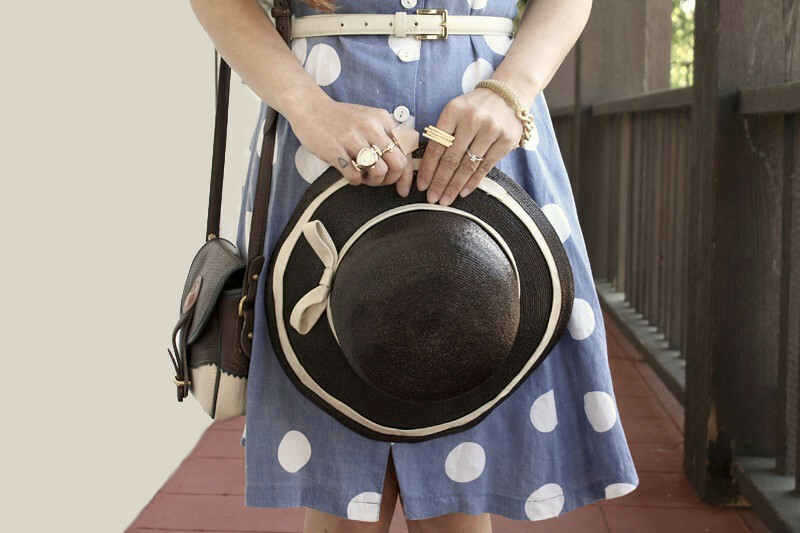 I love the periwinkle color of this vintage dress, and with the white polkadots it looks great with all the dark brown accessories! On a different note, I should wear hats more often! I actually have lots of hats but I just never wear them. I ought to change that! Speaking of hat, I want to tell you about the hat I am wearing here. I bought it on Etsy last year for under $20. The label on it says Lilly Daché whom, at the time, I was not familiar with. Recently, I did some research and apparently Lilly Daché was a French milliner and fashion designer. She was kind of a big deal, designed for many Hollywood films, and had many famous clients. Designer Halston even worked for her before starting his own business! Today, her designs and hats are valued highly by collectors of vintage clothing. I had no idea this little hat of mine has such history and story! 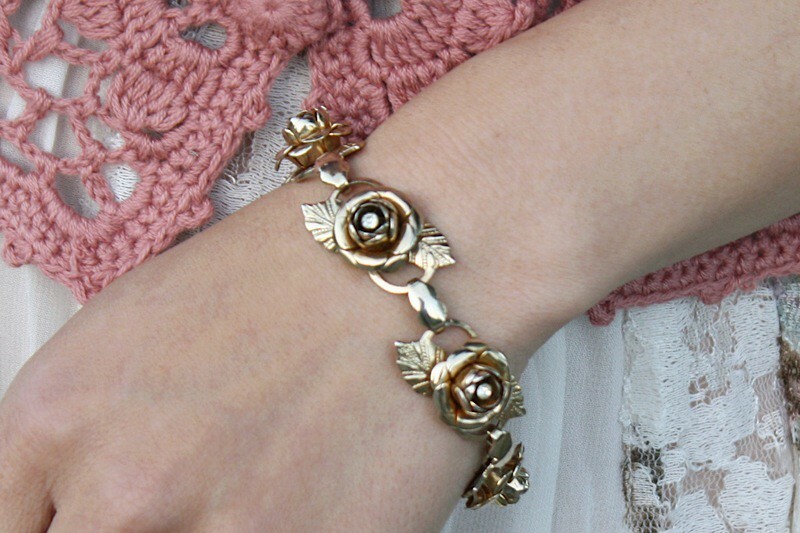 This is why I love vintage! 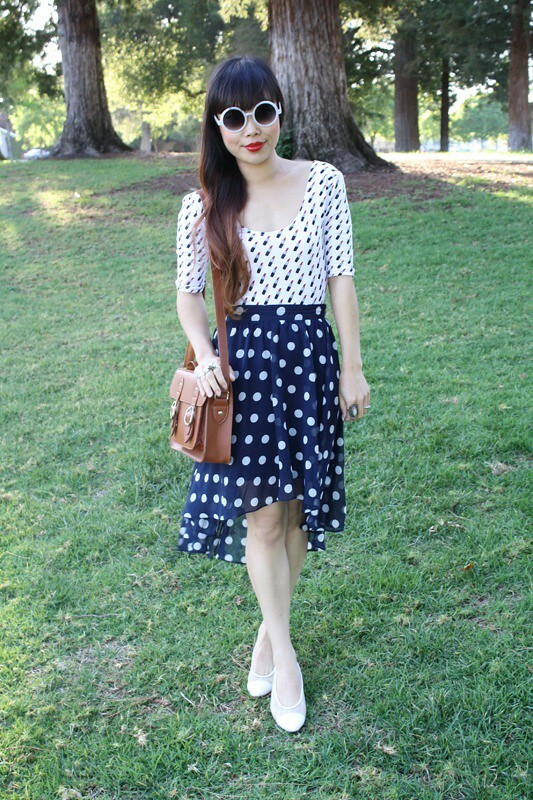 Thrifted vintage polkadots dress by Avocado. Thrifted vintage white leather belt. 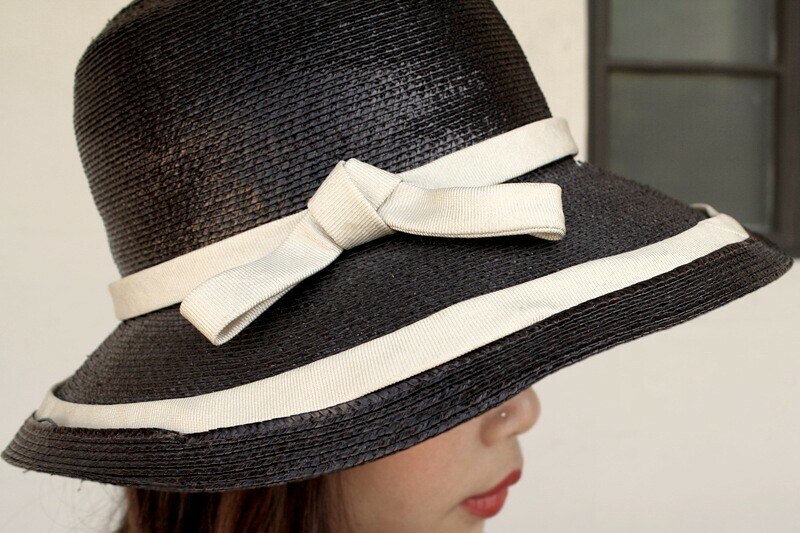 Vintage hat by Lilly Daché from Etsy. Two tone cut out oxfords by Dollhouse from UrbanOG.